BlackBerry has officially launched BlackBerry Z10 a 'touchscreen' BlackBerry smartphone running on new mobile OS platform BlackBerry 10. 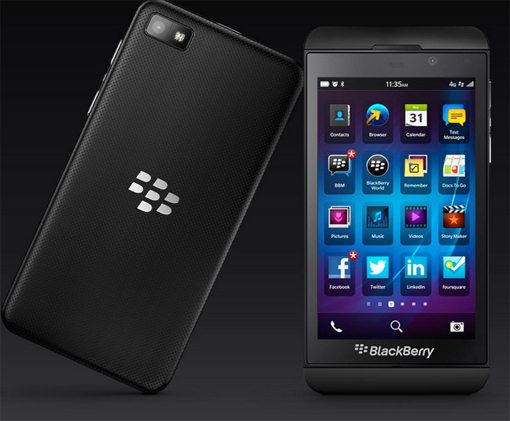 In the Philippines, BlackBerry Z10 is expected to be at accredited BlackBerry devices stores on Match 20, 2013. It's most awaited mate, the BlackBerry Q10 also running on BlackBerry 10 OS but bears the famous BlackBerry hard QWERTY keyboard is rumored to be release on May this year. 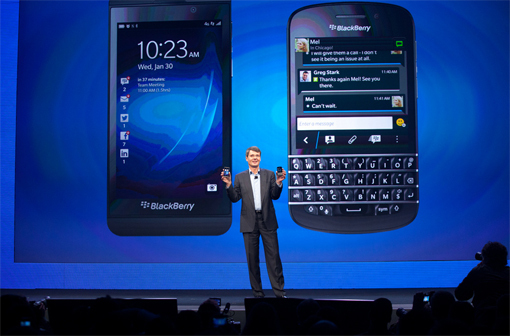 BlackBerry CEO, Thorsten Heins, holding BlackBerry Z10 and BlackBerry Q10 during BlackBerry 10 global Launch in NYC. BlackBerry Z10 has an introductory price in Philippine market at Php 29,990.Available in two colours, Black and White. BlackBerry Z10 is powered by a 1.5 GHz dual core processor with 2GB of RAM, 16GB of internal storage, and an expandable memory card slot that supports up to 64GB cards. Connectivity-wise, BlackBerry Z10 features a micro HDMI out port for presentations, and advanced sensors such NFC (near field communications) to support mobile payments and the exchange of information with a tap of the smartphone. In addition, Facebook, Twitter, LinkedIn and Foursquare apps for BlackBerry 10 are Pre Installed. Instagram App for BlackBerry Z10 will also be available for Download soon. The ever present BlackBerry Hub, which is a single place to manage all your email, BBM messages, social media updates or notifications, and the ability to “peek” into the BlackBerry Hub by just one swipe. BlackBerry Flow, where the BlackBerry 10 experience excels by enabling features and apps to flow seamlessly together, helping you complete the task at hand effortlessly and efficiently. A soft touch keyboard that understands and adapts to you. BBM (BlackBerry Messenger) in BlackBerry 10 now has voice calling and video chat. BlackBerry Balance technology, separates and secures work applications and data from personal contents. BlackBerry Z10 Camera Feature Time Shift. BB Z10 Story Maker can let you produce an HD movie that you can instantly share. The new BlackBerry 10 browser, supports HTML5 browsing. BlackBerry Remember, which combines memos, tasks and much more. BlackBerry Safeguard technology that helps protect what is important to you. Built-in support for Microsoft Exchange ActiveSync. The BlackBerry World includes more than 70,000 BlackBerry 10 apps. For more information on the BlackBerry Z10 smartphone, visit www.ph.blackberry.com/BlackBerryZ10. 0 comments: on "BlackBerry Z10 and Q10 all running on new BlackBerry 10 Platform"